Very Good. 1411405137 Ships from Tennessee, usually the same or next day. Acceptable. The book is a readable copy showing signs of wear and the pages are intact. The cover may have some creases or minor tears. The dust jacket (if applicable) may be missing. The book may be an ex-library book. The book may contain: a publisher remainder mar some highlighting All orders guaranteed and ship within 24 hours. Your purchase supports More Than Words, a nonprofit job training program for youth, empowering youth to take charge of their lives by taking charge of a business. Very Good. 1411405137 Ships promptly from Texas. Can't go wrong with Steinbeck. Great story. Strong characters. Amazing ending. Mr. Steinbeck was a great story teller. It was almost as if you were there. Since I grew up in the Salinas Valley it was almost personal. Great interaction between the characters. I was interested in the title- a well known quote from Robert Burns "the best- laid plans o' mice an' men gang aft agley". The style of the book is also from another era and interesting from a historical viewpoint.I can understand why it has been a studied text for English Literature. Descriptions are first class. Have now moved on to another book by this author "Cannery Row". Now in my retirement years I am discovering a whole new world from my armchair. John Steinbeck turned the search for the American dream and turned it into a nightmare. George and Lenny are two drifting farm hands looking to find work to earn enough money to buy a small farm of their own. Its the only dream they share to find a place to call home. The problem is Lenny is big ,strong and slow. He doesn't know his own strength or realize there will be consequences for his actions. George can keep him safe for only so long. What George hoped to be their last job for someone else turns out to be their last job ever. 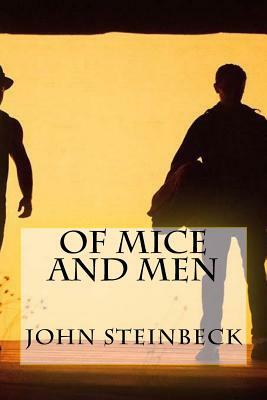 Written in language of the common man of the time, Steinbeck does an excellent of capturing George's desperation and Lenny's fear. A moving story that has been always one of my favorites.